The man in charge of England's flood defences has called for a debate on whether communities at the highest risk should be abandoned and their residents permanently relocated. Sir James Bevan, the Environment Agency chief executive, said England could not continue to build taller, stronger and costlier concrete defences for ever. In a speech in Telford, he asked if it would be safer for people to move. The UK "owed it to future generations" to think the unthinkable, he suggested. Addressing the Flood and Coast Conference, he also called for homeowners to be more aware of the risks they faced and for businesses, councils and other organisations to share more of the cost of funding flood defences. Central government accounts for about 90% of all English funding on flood risk management and defence. According to a 2016 government review, 12% of England's land mass, 8% of the population and 2.4 million homes and other premises are vulnerable to coastal and river flooding. In the wake of the devastating 2013-14 winter floods across southern England, the then prime minister David Cameron pledged to spend whatever it took to rebuild communities and ensure they weren't swamped again. Sir James said the UK had strengthened its capacity to deal with flooding since then and the equally devastating floods in the north of England in the winter of 2015-6. But, in the longer term, he said government would have to rethink its approach "from first principles", suggesting what had worked so well in the past and continued to do so "may not be enough in the future". While vital infrastructure such as the Thames Barrier would likely have to be upgraded in the years to come, he said there was a limit to the protection "hard" structures could offer and "more concrete was not the answer". 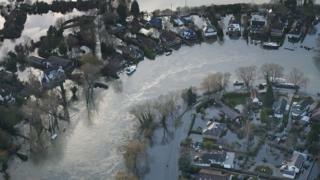 "In the face of the rising risks and costs, it won't make sense to go on building ever taller, stronger and more expensive concrete defences as the default solution to flood risk," he said. "The engineering won't work and the humans won't put up with it. You can only build a wall so high before people stop wanting to live behind it." While he made clear he was not calling for high-risk communities to be uprooted, he said the argument that it would be safer and cheaper to do so than to continue to defend them had to be confronted. "There are places on the coast and on some of our major rivers which are already costing millions of pounds a year to defend and those costs will only rise over time," he said. "Do we want to defend every inhabited location or should we consider moving some communities? "I am not saying we should do that. I know how important place and community are to people. I am saying we should be prepared to have the debate." In its 2016 flood resilience review, UK ministers acknowledged alternatives to "hard solutions" were needed, with more emphasis on natural flood management and water planning, both down river and upstream.